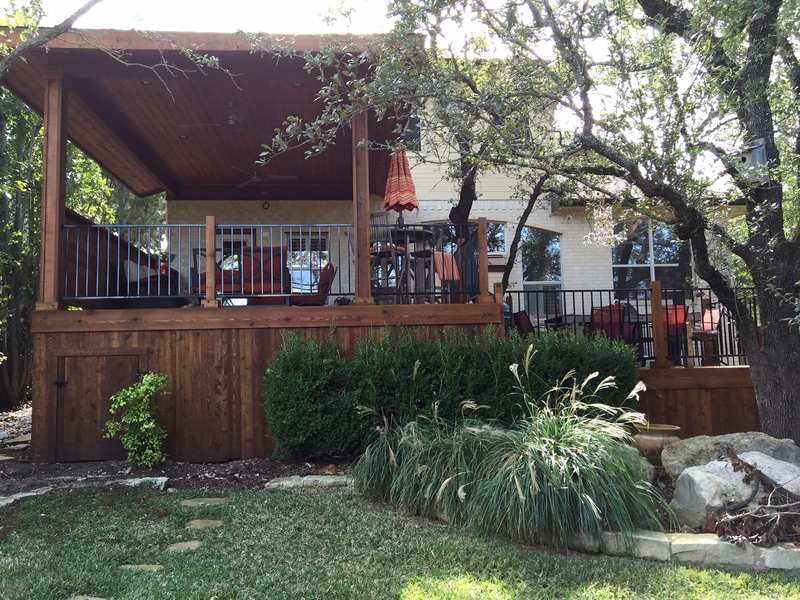 Our Austin Elevated Deck and Porch Project in Steiner Ranch is the Epitome of Rustic and Romantic! One of our recent projects in the Steiner Ranch area of Austin, TX, takes outdoor living enjoyment and beauty to a whole new level. The project incorporates an elevated deck and porch cover we designed to become one with the surrounding landscape while still looking original to the home. In this era of synthetic materials, it is refreshing to design a space that incorporates the rustic benefits of natural wood. 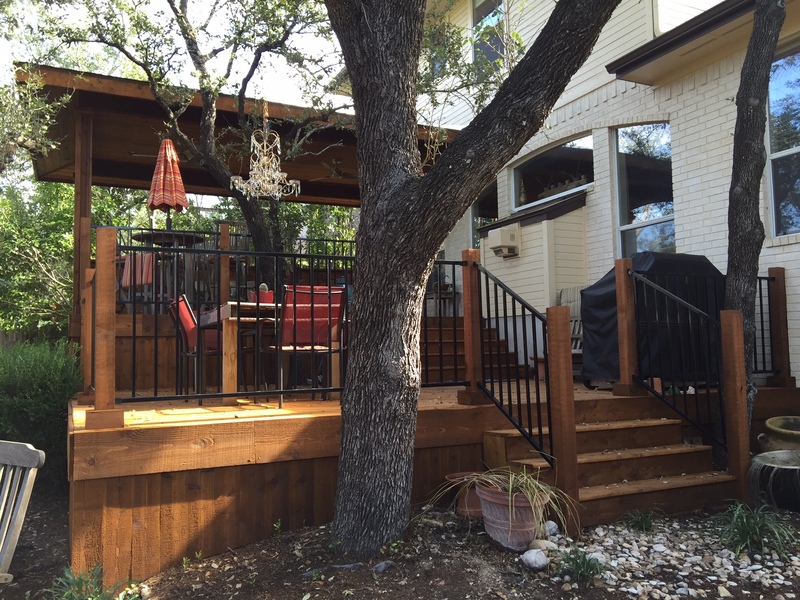 Archadeck of Austin uses a diverse selection of materials including composite, PVC, metal and many natural woods as well as stone native to the Austin area. For this project, we used aromatic cedar almost solely, including cedar flooring and a flat cedar ceiling within the covered porch space of the project. Along with the aesthetic appeal of Cedar, it also resists moisture and insect infestation. Even if it is left untreated, it weathers to a silvery gray over time. Cedar also has remarkable dimensional stability. This means the wood has minimal change in size or dimension despite weather, humidity or temperature conditions. Many types of wood will warp when subjected to moisture, but cedar stays straight and flat which makes it perfect as a decking material. The covered porch portion of outdoor living combination is easily accessible from the interior of the home and adds valuable living space perfect for outdoor dining and entertaining.The Cedar hip roof over the porch extends out further than most traditional roofed designs in order to add an extra layer of protection from wind and rain. This allows the homeowners to utilize the space in almost any weather. 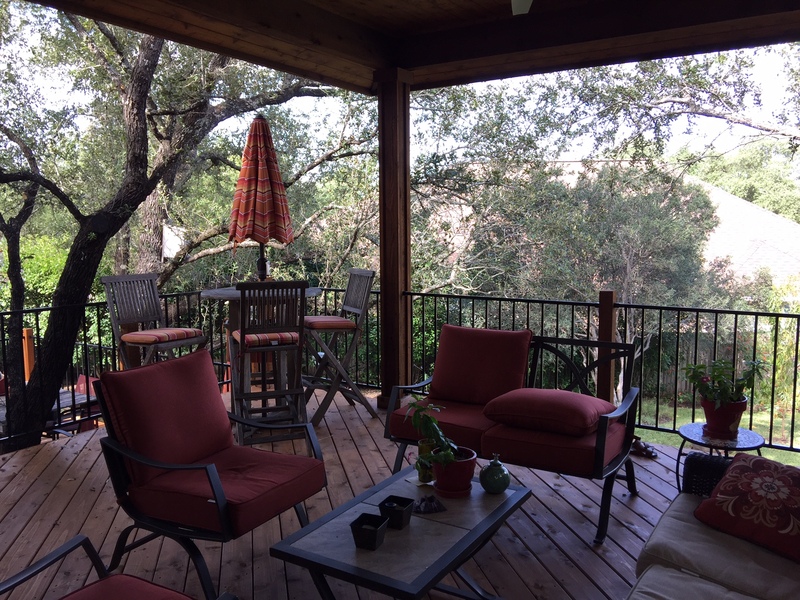 The outdoor space then extends via a stepped-down area into a spacious all cedar deck perfect for grilling, conversation and star-gazing into the open Austin sky. The design as a whole really is the epitome of having the best of both worlds for these Steiner Ranch homeowners to use at their leisure! As is evident from the pictures above, the entire outdoor living space melds into the landscape as if it has always belonged there. This ingenious design takes native to a whole new level by the subtle integration of the beautiful trees on this wooded lot too! If you would like to learn more about creating a one-of-a-kind outdoor living space in your backyard, contact Archadeck of Austin. We specialize in custom outdoor living structures designed with your lifestyle and individuality in mind. You can reach us at (512) 259 – 8282 or via email at jim.odom@archadeck.net. This entry was posted on December 1, 2015 by austinporchandpatio. It was filed under Archadeck of Austin, Austin decks, Covered porches, Multi-structure outdoor living areas and was tagged with Archadeck of Austin, Archadeck of Austin design, Austin deck builder, Austin outdoor room, Austin TX cedar decks, Austin TX Cedar porch and deck builder, Austin TX cedar porches, Austin TX covered porch builder, Austin TX deck and porch cover combinations, Austin TX deck builder, Austin TX porch covers, Steiner Ranch outdoor living space builder.